With 19 responses for the Pan-Arctic Outlook, the June Sea Ice Outlook projects a September 2012 arctic sea extent median value of 4.4 million square kilometers, with quartiles of 4.3 and 4.7 million square kilometers. This compares to observed September values of 4.6 in 2011, 4.9 in 2010, and 5.4 in 2009. Both the 2012 quartile values and the range (4.1–4.9) are quite narrow. The 2012 June Outlook differs from all previous Outlooks in that there are no projections of extent greater than 5.0. It is always important to note for context that all 2012 estimates are well below the 1979-2007 September mean of 6.7 million square kilometers. Distribution of individual Pan-Arctic Outlook values (June Report) for September 2012 sea ice extent. Individual responses are based on a range of methods: statistical, numerical models, comparison with previous rates of sea ice loss, composites of several approaches, estimates based on various non-sea ice datasets and trends, and subjective information. The consensus is for a continued downward trend of September sea ice. It seems that the time may have come to declare that the arctic sea ice has in fact reached a "New Normal." The physical justification for this statement is based primarily on the loss of old, thick sea ice and the increased mobility of sea ice. An expanded discussion of sea ice age and thickness is included in this month's full report, which includes new sea ice thickness data from NASA IceBridge aircraft flights in March-April 2012. In addition to the Pan-Arctic Outlooks, there were six contributions to the June Regional Outlook report. The regional outlooks shed light on the uncertainties associated with the estimates in the Pan-Arctic Outlook by providing more detail at the regional scale, including: the Northwest Passage and Hudson Bay/Hudson Strait shipping routes, Beaufort/Chukchi Seas, the Canadian Archipelago/Nares Strait, and Barents/Greenland Seas. The 2012 Sea Ice for Walrus Outlook (SIWO) was launched in early April and provides online reports for use by Alaska Native subsistence hunters, coastal communities, and others interested in sea ice and walrus. The weekly SIWO reports integrate local observations, satellite imagery, and sea ice and weather forecasts. SIWO is supported by the National Oceanic and Atmospheric Administration (NOAA) and NSF and organized by NOAA’s National Weather Service, the University of Alaska, ARCUS, and the Eskimo Walrus Commission, with significant contributions from Alaska Native sea ice and walrus experts. Plans are underway to expand both the Sea Ice Outlook and Sea Ice for Walrus for 2013; please contact Helen Wiggins, ARCUS (helen [at] arcus.org), with any ideas for future improvements for either project. 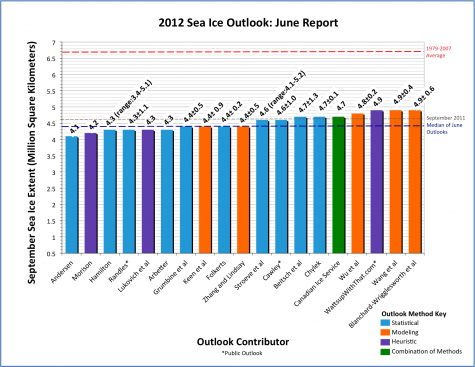 For more information about the Sea Ice Outlook and to see the June reports, go to: http://www.arcus.org/search-program/seaiceoutlook. For more information about the Sea Ice for Walrus Outlook and to see the latest weekly report, go to: http://www.arcus.org/search-program/siwo.